So does anyone know if Nissian is shipping newer cars to dealers or have they stopped shipping altogether? Reason I ask is that here in NJ, none of the three dealerships near me have taken receipt of any new maximas since the received the first communication of the stop sale over two weeks ago. Nope, just a car junky. I think that is just coincidence. Also why would they keep adding inventory at the same rate when they have 30 cars sitting on the lot for a month. True. The assembly line has not stopped. All cars assembled after a certain date are fine, and are being shipped to dealers. Just heard from my dealer - they said two more weeks before my car (on hold with deposit) is ready and stop sale lifted. That is not too bad a delay for this type problem. The new, improved fuel sending units must be made available to the dealers. The unit fits at the bottom of the fuel tank, so the fuel will probably need to be removed, then the old sending unit removed and the new sending unit installed, then refill the tank, check for leaks, test-drive the car to be sure the new sending unit is working, then make a final check for leaks. The two time-consuming steps are, of course, getting the new sending units to the dealer, and the dealer fitting all the affected Maximas into his work schedule. Right - I just hope it's not the dealer blowing smoke up my *** in order to get me to paper the car right away. Ive asked them for some assurance that if I paper it, it will actually be available for pickup in 2 weeks. Dont want to be paying for a car I cant take delivery of. Can't say I blame you on this. Dealers really want to be known as honest and correct, and most try. But they are often in a position (such as this) where they really have no way to be sure of anything, in which case, some have been known to blow a tad of smoke from their poop deck. Bummer checked then VIN and mine is on the list. the 8th gen I envisioned it different more like this! but if we could have our dreams answered rwd 330hp that would be a miracle! Edmunds released an article today detailing the recall (at least as much info as Nissan has released). The article made it sound like it was going to be two more weeks before Nissan releases a fix to the dealerships. Not good news for those of us whose Maximas are being held hostage by the dealerships. He added, "The car is safe to drive". Of course, its only safe to drive until you get into a crash and you and your family blow up in a ball of fire, then, its not as safe . Reminds me of the Challenger disaster and the continuous O-ring issues. Last edited by WasDmater; 08-15-2015 at 07:23 AM. I also called the Dealership takked with Both the Service Manager and General Manager....they also said no big deal as they would notify me when the part came in......currently have 3,000 miles and am going to need service shortly so hope these parts show up soon I purchased the car 6/11/15 and still have not heard anything from Nissan? PS Dealership told me they are selling everone that they get so they seem to be oblivious to the whole issue. That's interesting. I went in July 18th to buy a Coulis Red SR they had on the floor and the manager came over and said we could draw up the paperwork and it would technically be sold to me, but that Nissan had just issued the stop sale so they couldn't let me take it. So, if it's two more weeks until "the fix" is released, that will make six weeks that my car has been held hostage. Nissan was quick to issue the stop sale, but issuing the fix is a different story. I'm no mechanic, but if it's an O-ring issue at the tank, I would think that would be a relatively easy fix. Since this is a safety recall, I would think the government would require a certain amount of testing in order to confirm to government agencies that the fix corrects the safety problem. We sometimes forget that any redesigned vehicle (new generation) is required to go through rather involved government safety testing before the manufacturer is allowed to sell them in the U.S. Same regulations may apply to fixes to safety issues. For those of you affected by the recall and who have had your car held hostage as mine was, I received word from my dealership today that they had received the parts to implement the fix. I would assume that all of the dealerships would either have the parts today or will be getting them very soon. I just wanted to provide a heads up for everyone and pass along the good news. I talked to my dealer on Friday. The service manager told me the parts for the gas tank recall are ready to ship. They involve a new gas tank. He said they are automatically being sent to dealers for all undelivered cars, but for cars that are out on the road, like mine, the dealers have to put in an order for the parts. This doesn't affect me yet (I'm ordering my car from the factory as soon as my Internet Manager agrees to my offer), but a friend at my dealership said the parts are now arriving to fix the gas tank problem that has been the major holdup. Shouldn't be long now. So my dealership just called, and told me that the parts arrived today and they will be able to get it installed quickly. I should be able to purchase the car on Saturday (fingers crossed for tomorrow afternoon). So I am about a day away from closing on a Storm Blue Platinum with charcoal interior!!! My wife and I both like the Storm Blue. Low profile, but very classy. Looks like it belongs at the Country Club. I got word from the dealership that my Maxima is ready for pick up tomorrow. I am excited. I'm picking my ride after work.. Isn't this sort of a 'high point in life?' I always have this wonderful feeling while driving a new Maxima home. I have been doing this with the first model year Maxima of each new generation since getting my 1985 in October 1984. And it was the same feeling with Nissan Datsuns before that. It never grows old. In fact, I seem to be more excited with each new generation Maxima. Things like this really make life worth living. The last few seconds are of particular note! Very impressive. I feel safer driving it now. But, a lesson to be learned. If you're in a crash, whether you tip on the side or not: GET OUT OF THE CAR AS SOON AS POSSIBLE! Finally, it's nicely tucked in my garage. I didn't check the length but it's longer than my wife's 2010 Highlander. Last edited by Gildarts; 08-28-2015 at 11:48 PM. Thank you. That's exactly how I feel now. When I first saw those tail lights in the Super Bowl ad, I was a little disappointed. But they have gradually grown on me, and now I think they are not bad. The lights up front certainly make up for any shortcomings in the rear. The front lights sort of resemble an angry monster coming to eat up anything in front of it. I'd like to see the small front overlap or whatever it's called. That's the one that really shows a car's strength. The labor was over $800 (which included installing my Rocker Panel Moldings), but paid by Nissan, of course. It took them 4-1/2 hours to do and it came with a full tank of gas. They gave me a 2015 Murano as a loaner, which was several steps down from the Maxima. Just an FYI from Phila PA I took my Max in for the 5000 mile service the manager said did I know there was a recall on the fuel sending unit....I said yes he said sorry they dont have the part. I asked if this was something I should be concerned about? He said once I get an offical recall notice from Nissan contact them and they will try to set something up but not to be too concerned! I just got my recall notice in the mail. I already knew it was coming and had called the dealer who never called me back. The notice says the fix should take an hour but the dealer may need the car longer. So I am guessing dealers must have the part now. My car was pulled while I was waiting for it to be delivered. The dealership found another vehicle for me within a day or so. 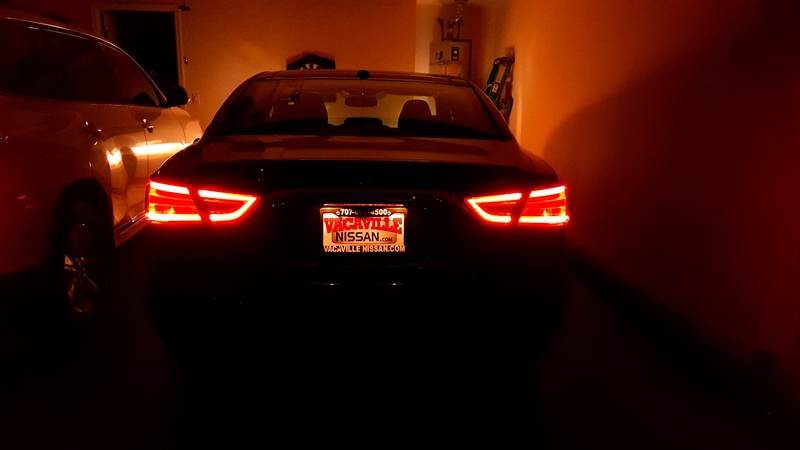 The new car also had the factory painted rear fin with light and illuminated MAXIMA on driver and pass running boards at no additional charge.